SCARBOROUGH, Maine – Eddie MacDonald passed American Canadian Tour (ACT) point leader Scott Payea for the lead on lap 41 and went on to win the Coastal 100 at Beech Ridge Motor Speedway Saturday. MacDonald was shadowed by Payea the rest of the way as race stayed under green from start to finish. 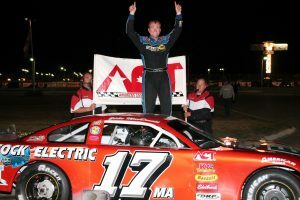 His winning margin of three car-lengths was the farthest MacDonald ever got from Payea, who was attempting to break his own record of four consecutive ACT Late Model wins. Jimmy Hebert finished third well behind the leaders a short distance head of a torrid battle for fourth that went to Jean-Francois Dery. Rowland Robinson Jr. (from 13th) was a close fifth, three feet ahead of Oren Remick, who edged out Rich Dubeau to finish 6th. Miles Chipman, Dillon Moltz and Shawn Swallow completed the top ten. Payea started on the outside pole and quickly grabbed the lead. Remick took up hot pursuit from the fourth starting spot before yielding second place to MacDonald on lap 23. At the halfway mark, MacDonald was in front with Payea glued to his bumper while Hebert worked underneath Remick for third, several car-lengths off the pace. MacDonald’s win was his first ACT victory this season. He has five top-5’s in his last five starts at Beech Ridge, including a win in 2013. Miles Chipman, Josh Masterson and Payea won the qualifying heats. The next event on the American Canadian Tour is at White Mountain Motorsports Park Saturday, August 19. For more information, visit www.acttour.com or www.whitemountainmotorsports.com.